Thank you for visiting our new Internet site. This site is still under construction but we want to give you the opportunity to stay in touch with our company and our offers. 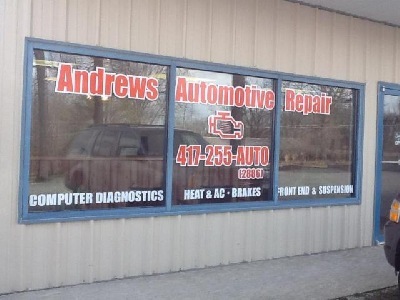 In brief, you should know the following about us: Andrews Automotive Repair is located in West Plains, Missouri and has the most up to date diagnostic equipment to get your car up and running properly again. Our location features five large bays, a large parking lot, comfortable waiting area and accepts cash, check, debit and credit. On top of our quality service and competive rates, Andrews Automotive Repair offers 10% off labor rates for Veterans, Active Servicemen, SMU students with a valid ID and OMC employees. - Inspections and MUCH MORE! CALL OR STOP IN TO GET YOUR FREE ESTIMATE!